Russia never officially exported any cars to the United States. 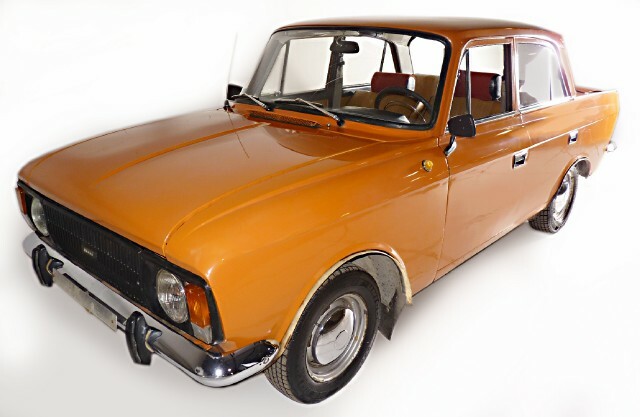 They sent a few Lada models to Canada (and a few of those later found their way here), but the Moskvich (also spelled Moscvitch) never made that journey. During the Cold War anything from Eastern Europe was slammed by the west. (Propaganda coming hard and fast from both sides.) 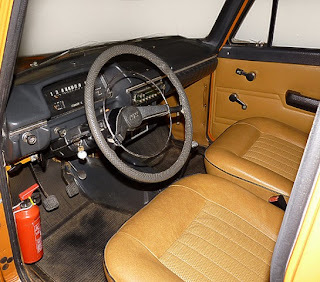 Ladas were called terrible cars by the automotive press, but gained a reputation among "those in the know" as being tough little cars that would last for quite some time if given regular routine maintenance. (And, with a few mods - mostly Fiat parts - they could be fun to drive.) Cars by Moskvich were also slammed, but in this case most of the criticizm was valid. The 412 / 2140 / 1500 was not built for performance. The 1500cc engine ("based" on an older BMW engine, but BMW had nothing to do with that) was not a high performance engine and it took almost 20 seconds for this car to hit 60 MPH. The car's handling was not good and its build quality left a lot to be desired. The styling is similar to most European sedans of the 1960s. It's boxy and practical. It even appears to be fairly roomy. Although not introduced until 1964, AZLK started designing this car in the late 1950s and it has little tail fins. An interesting design touch is the turn signals located on the fins. This car is being sold by a place called Dezer Collection Museum and Pavillion. They give no history of this car or any written description of its condition. (The text in the ad is essentially a Wiki article.) It looks like there is some rust on the lower rear quarter panels and the engine compartment is not as clean as the rest of the car. I don't know enough about these cars to know if the hose sticking out of the firewall went to the heater core or if it's some sort of drain hose. (Although it would seem odd to route water into the engine compartment, so I suspect it's from a disconnected heater core.) The trailer hitch is a bit scary, too. A 1500cc engine that can barely move the car should probably not be pulling a trailer. You can e-mail or call Dezer for more info. The Dezer Collection Museum and Pavillion is located in North Miami, FL. You can find the ad for this car here. One problem... it's not a Moskvich :) Moskvich cars were made by the AZLK factory in Moscow, hence the name. This particular example is Izh 412, made by the Izhmash factory in Izhevsk. As far as not being fun to drive, I beg to differ - Moskvich 412 have been very successfully rallied in the 60s and 70s, taking the podium in multiple events. And the price... total crack-pipe. Thanks for the info about where it was built! As for its "fun to drive" qualities, there is a large Russian immigrant population in the town where my business is located. Many of the guys are "car geeks". (Although in some cases explaining the word "geek" to them has been difficult!) 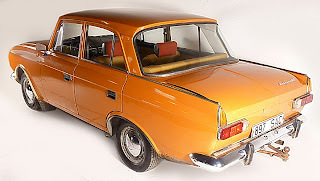 I've always been fascinated by Eastern European cars and I'll talk to them quite a bit about them. My knowledge (or lack thereof) about the Moscvich (and other Russian cars) is based on what they tell me. I'd love to get my hands on this car for a day and put it through its paces, but I suspect the "museum" wouldn't be thrilled about that idea! I agree about the price. I've come across that car before on my own. Now, I live in Florida, but a few hours north of Miami so I've never been to that "museum" before. I hadn't even heard of it until a few months ago. I can't imagine anyone buying the car unless it's another museum or it's the geekiest of Car Geeks... or maybe some Bolshevik expatriate who wants a car that reminds him of Mother Russia. It's still a nice car to learn a little more about and look at, but I wish more info was given about that particular orange vehicle itself, like how the heck it ended up in Miami. Blair, I agree with you. I also would like to know "how the heck it ended up in Miami." Funny how the so called "museum" has no "history of this car or any written description of its condition." The fact is the US has just finished deporting around a dozen Russian spies back to the U.S.S.R. I'll bet at least a few of those "sleeper agents" drove to Miami from Moscow, then they ditched the car. Seeing as this car was equipped with a hitch, I'll bet the other agents had to ride in the "trailer." In the late 80's, this car would have blended in quite well with all of the other four door Fiats at the local junkyard. As for those "disconnected hoses," no doubt they were attached to an empty box in the engine compartment that was once filled with American passports and microfilm. I say, "Deport it with the rest of the comrades!" this particular car from the picture is from BBC Talkshow Top Gear and before it was bought to the show form Estonia smalltown called Paide. Price was 350 $. the pirce has gone up. 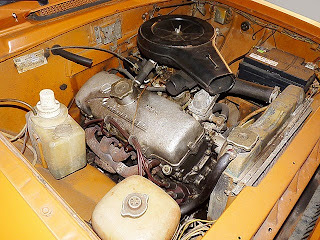 Can't say anything about this exact car, but the Izh-412 is still warmly remembered in my home country as an extremely tough, reliable and easily repairable workhorse and also as a very cheap and popular family car equipped with a relatively powerful and well-made engine capable of 75 rear-wheel horsepowers. Back in those days, it was also a successful rally car popular among racers and left the very best memories in my family (we owned one in the 1960s-70s, in a much better condition, equipped with better headlamps and a stylish chrome grill identical to this one: http://content.foto.my.mail.ru/mail/magakov/1294/h-1326.jpg. The car proved to be durable and built to last forever). It surely deserves a place in an automobile museum.